It’s almost as if we’ve forgotten how to present without PowerPoint. But what causes this reliance? And how can it be fixed? We have spent 10 years analysing presentations of all hues – and we believe the answer is the message-led presentation. To put it simply, deathly presentations happen when they are slide-led. If your presentation feels like you are talking through a document page-by-page, then it’s a sure sign of a death-by PowerPoint experience. While it may feel that you are making progress if you create your slides first, you are probably wasting your time. You are more likely to produce dull data dumps than illuminating visuals. In fact, even using the word ‘slide’ is a mistake. The word slide means it’s unclear whether you are producing something to be read at a desk, projected on to a screen or just bulleted reference points. The key is to be more precise when talking about presentations. Create HANDOUTS, to be read at a desk, and VISUAL AIDS, to accompany your talk. Make a clear distinction between these two documents, which are as different as a book and a movie. Use more precise language to create better handouts and visual aids. By changing the way you prepare for presentations, you can transform their quality – and delight your audiences every time. Our 6-step message-led approach reverses the way many people work. With the BBA Approach you start with a blank sheet of paper – and only create your visual aids towards the end of the process. Too many people give too many talks without a distinctive set of messages. That’s like trying to build your presentation on sand. Instead, great presentations are built on clear messages. Messages are the solid foundation on which your presentation stands. With your foundations in place, you can decide how to structure your presentation – the beginning, middle and end. You decide the few big ideas that underpin your presentation and how to bring it to life (e.g. facts, stories, metaphors) and the method of construction (e.g. mystery, humour, documentary). At this stage you can decorate your talk with creative flair by incorporating rhetorical flourishes and entertaining anecdotes, adding some light and shade to highlight your messages. Now you can open your computer and fire up PowerPoint. By leaving it until this point, you’ll know where visual aids will best help your audience. Is there a complex process that needs explaining with a diagram? A graph that will bring sales growth to life? Or a few words that will reinforce what you want remembered? This is where PowerPoint can genuinely help. When you use visual aids, one powerful technique you can use is to say, then show. For example, you introduce a topic before showing the visual aid that reinforces that point. This technique is particularly effective for demonstrating that you are in control of your material. It’s the work you do refining what you say that ultimately helps you illuminate your audience – and avoid the dreaded Death by PowerPoint. 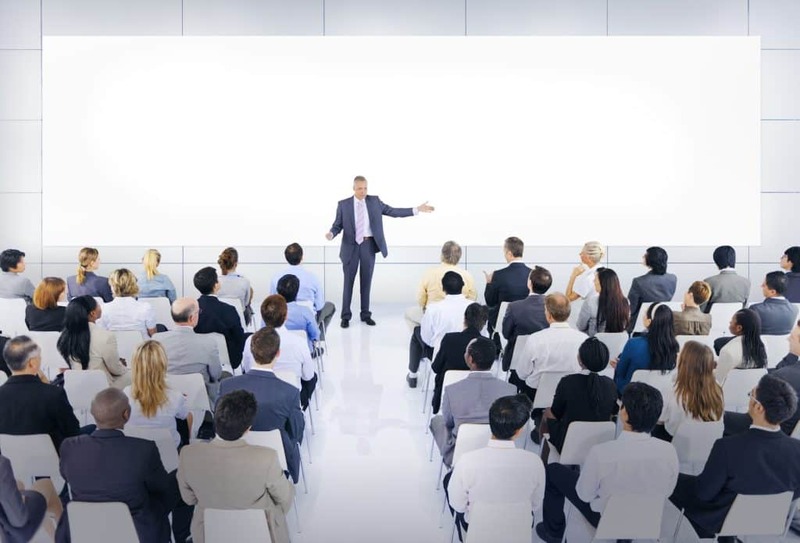 Are you preparing to deliver a Message-Led Presentation? If you want to transform your talks into persuasive, Message-Led Presentations that you can deliver confidently, then get in touch. We’ll help you look, sound and feel impressive so that you grab your audience’s attention. In just a few, short hours we’ll coach you to deliver clearly, confidently and with impact. And with just a few hours with one of our expert coaches you can transform the quality of your presentations – for life.